Denver...again. 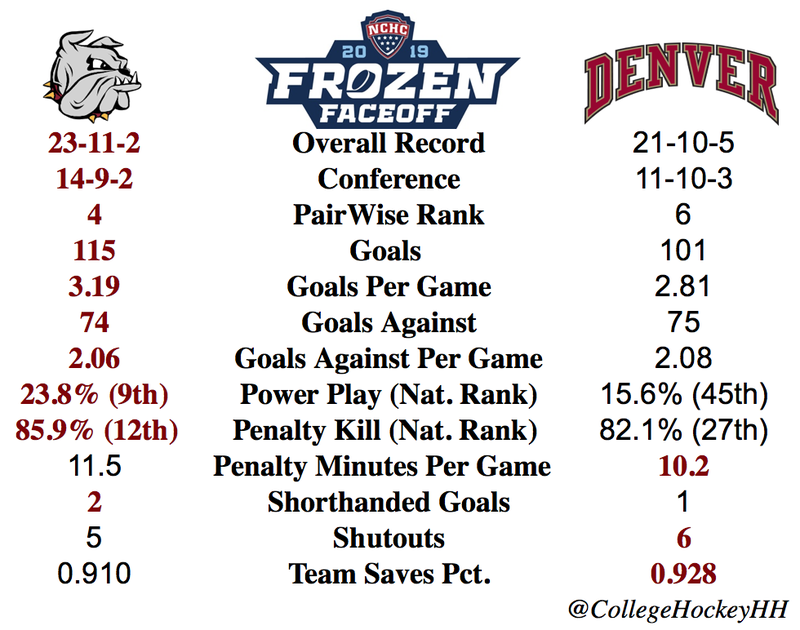 It seems like a postseason right of passage to meet Denver somewhere in the postseason for UMD. And it generally has not been good for the last few years. Before this year's home and home split series, UMD has done pretty poorly, 3-13-1, against Denver in the previous three seasons. So here we are. Denver is in the way of a rematch that UMD should want with Saint Cloud State to show them this is not as much of a blowout in the NCHC as the regular season standings indicate. Without the win, the only third place game in the nation will be the fate of UMD. First round of the college hockey playoffs brings the more pro-like series rather than a one-and-done format. This gives less of a chance for upsets, but they still do happen. Take last place Miami knocking off St. Cloud State, the same set up as this year, in 2013-14. 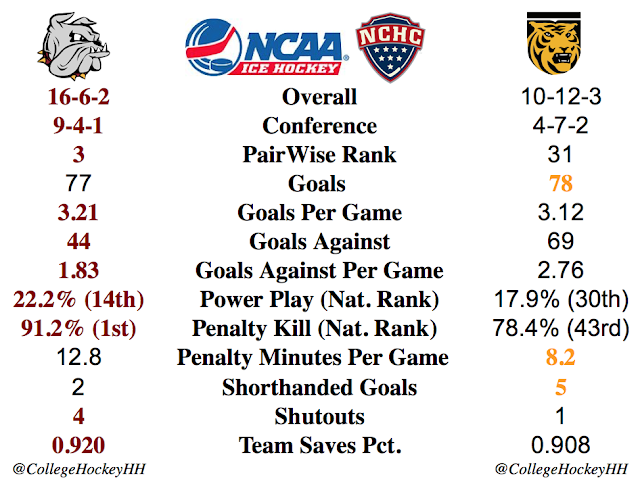 Colorado College at Western Michigan is an example of the winter that just does not give up. CC had trouble due to weather and plane issues getting to Kalamazoo, MI and their series is now set up to take place Saturday - Monday (if needed). As much as I would not like to go against the Broncos, the Tigers of CC are finally making the strides in their game that prompted me to pick them 4th in the preseason. This is my best bet for a first round upset. North Dakota at Denver seems like a good bet for an upset series and I do see this going three games, but in the end, Denver will prevail. With a lost series, North Dakota's season would be over. Miami at St. Cloud State is a no brainer this weekend. SCSU is primed for a long run and this weekend will just be the start. Omaha at UMD brings the second series between the two teams for the year. 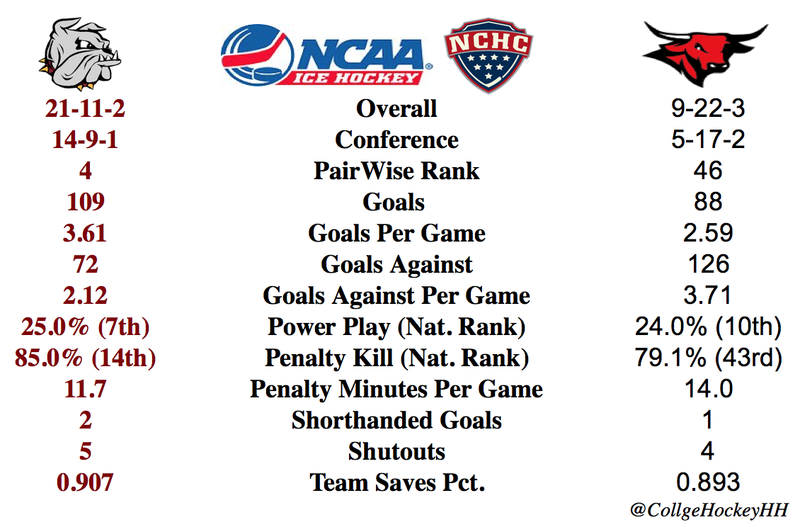 If the first is an indicator, UMD should have a good weekend. Since that late January sweep of Omaha by the Bulldogs, UMD have had just one sweep in five weekends. UMD has to use this weekend as a springboard for their future tournaments. Only meeting once this season, The Mavs and Bulldogs go at it again this weekend and again it will be in Duluth. UMD swept Omaha in January 7-2 and 3-1. Since that series meeting, the Bulldogs have had three splits, one sweep, and one time being swept in that order. So, things haven't been all roses for UMD. Omaha has had the same bad luck as the rest of the season going 2-7-1 since the last time these teams met. Ouch. 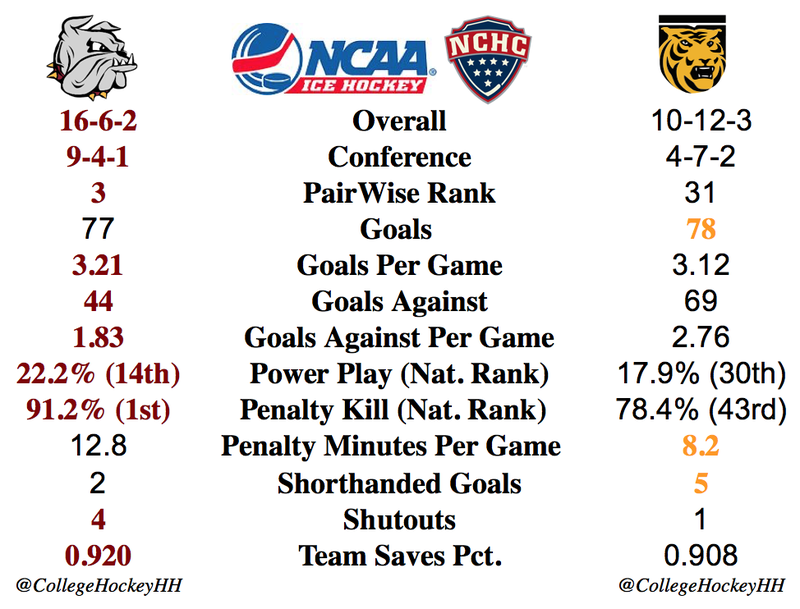 But that is how it goes for a team tied for last place in the NCHC going 5-17-2. It has been a rough year. Looking at the stats, it is all on the UMD side, but that doesn't mean that things have not gone well for the Mavs. 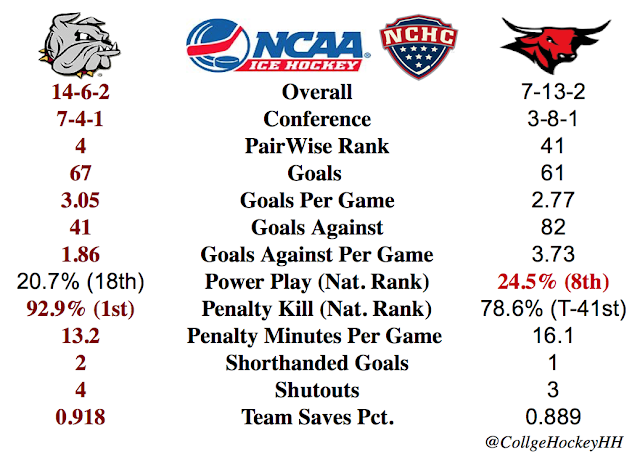 Their power play is top ten in the nation, four team shutouts, and their teams save percent is close to our criteria of 90% for a contending team. On the other hand, scoring defense is 58th out of the 60 Division I teams and have come out a winner only nine times this season out of their 34 games. 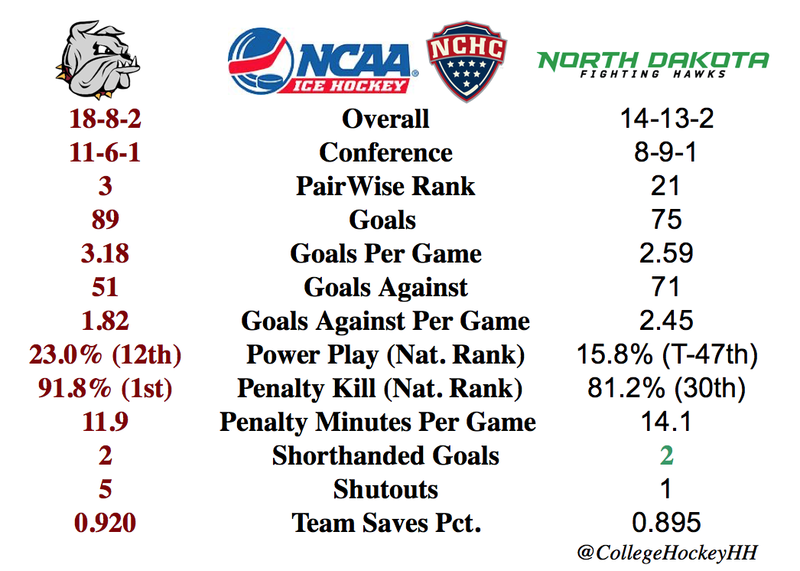 This should be a good weekend for UMD to get rolling for the playoffs, but no team in the NCHC is ever truly out of any game. After coming off of four straight shutouts at the hands of the Bulldogs, the Redhawks look to regroup and change their season outlook this weekend in Duluth. 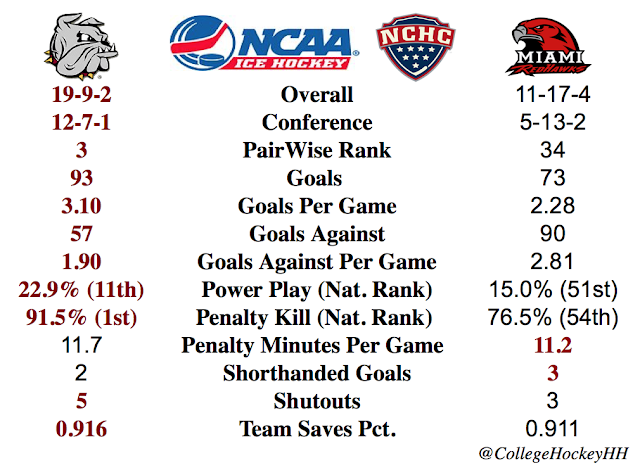 UMD has plenty to play for this weekend as one win against Miami will clinch home ice for the first round of the NCHC playoffs. At the heart of this weekend is Hunter Shepherd, goalie for UMD, who has four straight shutouts against Miami. Can he pull off another improbable weekend? Probably not, but who wants to go against whatever he has on Miami right now.